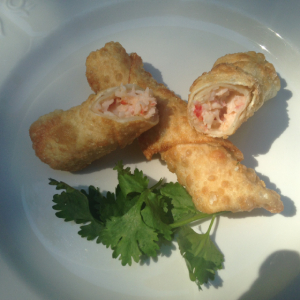 Lobster Boursin Cheese Stick | Recipes | Oceanfood Sales Ltd. Break up larger chunks of lobster sensation and mix in boursin and cream cheese evenly. Fold bottom of wrap paper over lobster mixture followed by the two sides and then roll to the other end. Place a dab of water on the corner to seal wonton. Lobster cheese sticks can then be frozen to make a week’s supply at a time. Deep fry for 2 to 3 minutes at 350 degrees until wonton is golden brown and serve. Serve with your favourite dipping sauce like garlic, dill, ranch etc. For more lobster recipes, check out our Lobster & Seafood Graffiti Pasta or our Lobster & Seafood Lunguini!